Will the Two look like the One? Inconvenient invite system aside the original OnePlus One is a pretty impressive phone, combining high end specs and a big screen with a surprisingly low price tag. What's not so surprising is that OnePlus plans to follow it up and we might have just got wind of some of the specs. 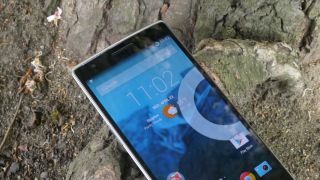 The OnePlus Two, if that's even what it's called, has been listed by CooliCool, a OnePlus One reseller, complete with a partial spec listing. It's not clear whether the details are speculative or based on some inside information, but the fact that only certain details are provided suggests the site may have some partial knowledge of the phone. According to the listing it has a 5.5-inch display, just like the OnePlus One, though the resolution hasn't been provided so it's unclear whether it will have a 1080p screen like the original or a QHD one as we're starting to see on other phones, our guess would be the latter though. The OnePlus Two is also listed as having a Snapdragon 805 processor, which would be an upgrade on the Snapdragon 801 in the OnePlus One, but given that it's not expected to launch until the second or third quarter of 2015 we were hoping for a Snapdragon 810. The listing goes on to say that it will apparently have a 16MP main camera (up from 13MP on the OnePlus One), a 5MP front-facing snapper, 32GB of storage and a 3300mAh battery, which would be an improvement on the 3100mAh unit in the original. Those specs seem pretty much in line with the rumours we're hearing about other 2015 flagships, so if the OnePlus Two is priced right it could be another winner. Of course it's impossible to say how accurate the listing is. The phone, which is currently showing as out of stock, is priced at $551.99 (roughly £352), which is quite a lot more than the OnePlus One starts at, but we'd wager that's almost certainly a placeholder. The Nexus 5 is another affordable Android flagship.